The descriptions of the Award patches & Take Action Project are a bit confusing. The following is a clarification of what the steps mean. Following that is an explanation of what parts they will complete in our session & what parts will be done afterwards. •Affirm your commitment to strive to be an heir apparent of air and all of Planet Earth's elements. The Breathe Journey is complete when they earn their Aware, Alert & Affirm awards. Part of this is done during the sessions but part involves completing a Journey Take Action Project, which reaches out to the community, therefore it has to be completed after the sessions. 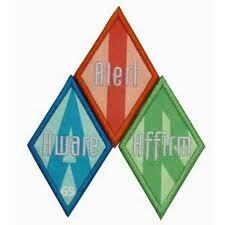 I will give the patch set to the leader/parent to be given out when this step is complete. If girls have attend all sessions (or turned in makeup activities for missed session). This is the progress they will have made towards completing the Awards by the end of session 4. Aware Award –.. They will have earned this award if they were present for our two guest speakers. Affirm Award – This award is earned by having things you can measure in your project plan. Finally the girls make a commitment to keep spreading the word about the issue addressed in the project or continuing to help the environment.